I have been thinking for a while now about where we find the role models for our future leaders, you know who I mean, the figures we recommend aspiring leaders model themselves on, and sadly, I keep coming up short when I try to think of public figures. These are usually the most visible potential role models for aspiring leaders to try to emulate, yet, when you really examine the type of character the media develops to portray leaders they are the virtual antithesis of the modern leader. We look for our societal and business leaders to be courageous, loyal, honest, ethical, open, supporting of their subordinates and reflective, yet, the media’s version of most leaders is the complete opposite. They are typically shown as manipulative, overbearing, unethical and reactive and, while it is easy to see that the media builds characters like this because they are typically easier to build a story around, they are very poor role models indeed. If any readers can think of a really good role model in modern media please do let me know. If finding role models in media characters is hard, identifying one in a political landscape is as hard if not harder. The modern political landscape had bred individuals who are partisan, will stick to an idea long after most of society has abandoned it because it is attractive to a sector of their voters or is a platform they themselves have sworn to support, they have a very short term view, looking to the next electoral cycle rather than the long term good of the constituency they serve, and, all too often, we find they have major character flaws and are, in at least some cases not fit to hold the office they have been elected to. At least in our sporting codes we find individuals who embody the team spirit and courageous leadership we look for in our business leaders, but they contrast between a leader of a sporting team who is one of an extremely small fraction of the overall population who were born with the necessary athletic prowess which they combined with a passion for their chosen sport and the luck to get the opportunities they need to flourish. While many of these are similar to the career paths of many leaders, sadly, again, many of our sporting idols are shown to have feet of clay and through one misdeed or another many bring both themselves and their codes into discredit in a greater proportion to the business leaders. There are, of course, excellent leaders in many sporting teams so at least there is a hope there, except that the form of dedication and training required to be a top flight sportsperson can misdirect many younger business people into the same highly self centered perspectives many sports people are forced to follow to reach the top of their field. Logic would suggest that to find the top business role models should be a case of looking in the top businesses, and this is often indeed the case. But, and it is a big but, many of the best in this area are so restrained and constrained by their own media personnel they are unable or unwilling to show their true selves in public. They instead become corporate figureheads, occasionally reduced to defending corporate transgressions or trade-off’s that they themselves may not want to support if they were not in the roles they held. Consequently, the field of candidates tends to self select down to just a handful of brave or foolhardy souls who shun the corporate control and instead stand up for their own personalities and beliefs. 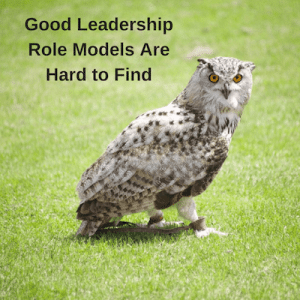 Thankfully, in most of the sectors I have identified above there are enough good examples of role models that aspiring leaders can at least see some role models to follow. The challenge though is to pick the good from the average and the average from the poor, especially when, for so long, the mass media image, through TV, film and the news outlets, has led us to idolise the very traits we usually abhor in our true leaders. So, when you find a real role model, someone you can aspire to follow without fear of subsequent disappointment, hang on to them and watch their every move, whether they be a sports person, media creation, politician or business person. They are rare indeed and need to be recognised for the positive influence they can be on future generations. Do you have any thoughts on leadership role models you would like to share? If so, we would love to hear from you.